Captions are the written text of the spoken word. 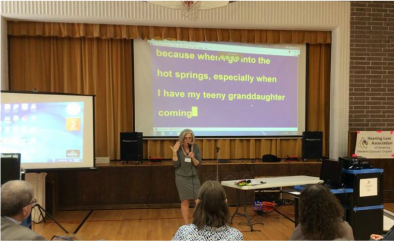 HLAA Chapter meetings use CART (Communication Access Real-Time Translation): the verbatim, near instantaneous conversion of spoken language into text. 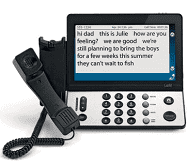 A stenotype machine, notebook computer and real-time software is used to produce the text. The text is usually displayed either on a screen by a projector connected to the notebook computer, or on a notebook computer or computer monitor. Live CART captioning on-screen can be provided three ways. CAPTIONED TELEPHONES show written captions of everything the caller says. The written text appears in a built-in display screen.